Mahpiohanzia – (n.) the disappointment of being unable to fly, unable to stretch out your arms and vault into the air, having finally shrugged off the ballast of your own weight and ignited the fuel tank of unfulfilled desires you’ve been storing up since before you were born. This may be a fabricated word; however, I find it quite relatable. Besides . . . don’t we only have words because someone arbitrarily decided on them? The restless part of my soul that has always longed to have the ability to fly would finally be complacent, at least for 40 seconds. I would soon be free falling from a height of roughly 14,000 feet. 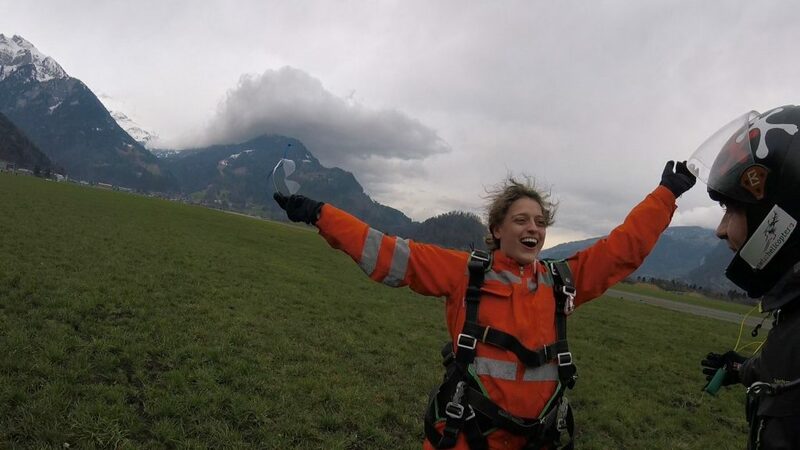 I’d been eager to skydive for a while now so of course I was ecstatic beyond belief. This does not indicate, however, that I was calm and unwavering in my decision. 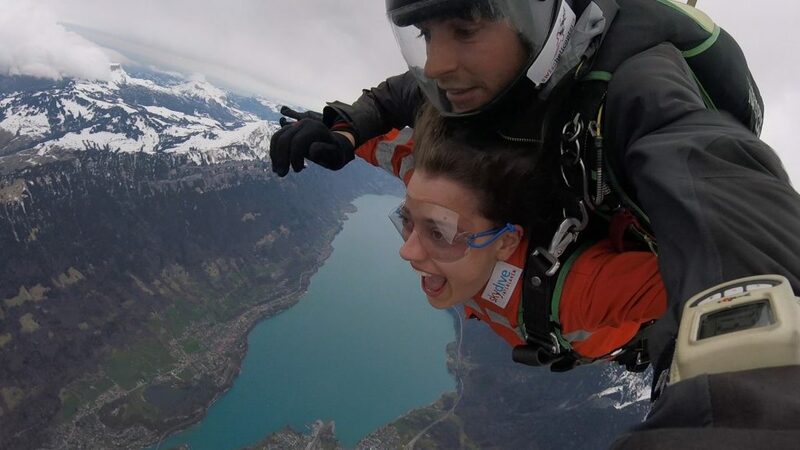 The insanity of jumping from a helicopter in a few short hours slowly materialized as my parents and I drove our rental car directly from the airport to Skydive Interlaken. My heart would lurch within my chest every time my mind would attempt to visualize myself jumping from such an immense height. The concept of free falling for more than the few seconds experienced while riding a roller coaster sent my stomach into a continuous somersault. My nerves remained uneased as the instructor’s explanation of the procedure lasted merely a couple of minutes. It seemed far too simple; I felt unprepared. I was slightly reassured by the fact that I would be physically fastened to a professional who’d jumped hundreds of times before. Once we were all set in the helicopter, we swiftly ascended past the trees moving far above the mountains. I kept thinking we had to be high enough yet our constant speed upwards persisted. We finally reached the desired jump point above two of the most iconic lakes in Switzerland (Thun and Brienz). Half-believing my own words, I told the instructor now holding my life in his hands that I was ready. He opened the door allowing gusts of wind to toss traces of freezing rain onto our faces. The very moment I stepped onto the skid of the helicopter, my fear evaporated. I stood there awestruck until our feet abandoned the safety of the helicopter. The free fall completely embodied the way I envision being free. My eyes darted around at the elegantly snowcapped mountains and strikingly turquoise lakes. Once the chute was pulled, we floated down slow enough to admire more of the landscape. It was unreal enough to pass for a green screen. I clung to the unique view knowing that I’d never again have the splendor of seeing the exact same perspective . . . a sight that only birds have the luxury of observing. After landing, I immediately wanted to go again. I began struggling to maintain a grasp on the experience as I felt it fading rapidly from my awareness. The euphoria lingered while I mentally checked off a major component of my bucket list. *Shout-out to my dad for being crazy enough to join me, and to my mom for letting us chase our dreams.